Our onboard naturalist, made our recent cruise to Alaska more fun and enjoyable by providing lectures and on the spot narrations of wildlife and glaciers you encounter on the inside passage of Alaska. Here is the writer alongside Mark Harris, the naturalist on board the Diamond Princess. Mark is very enthusiastic about sharing his observations about nature and wildlife... 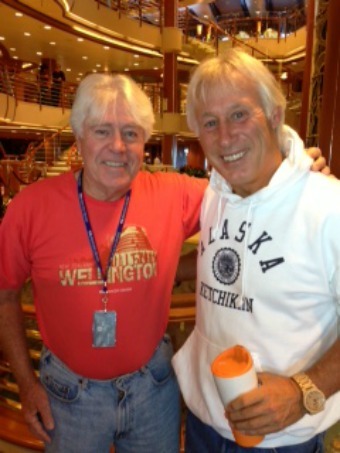 He was very approachable and his onboard lectures were some of the highlights of our recent cruise. In the winter, he acts as an onboard naturalist for the Hawaii cruises... In between he skis at Park City...sounds tough but somebody has to do it. Being the frugal cruisers that we are we opted to take the public bus in Juneau to see the Medenhall glacier ,part of the Tongass national forest. By walking the mile and a half from the bus stop to the visitor center, we were getting exercise (you need exercise with all the great food available on a cruise ship) and saving $24 when compared to taking the buses by the cruise dock... We were able to watch this gentle giant, do a little fishing, the stream was full of spawning salmon. When I asked Mark, he said this is a cinnamon colored black bear... Much less dangerous than the brown grizzly bear which can be identified by a hump on its back. There is no substitute for being up close and personal to such a bear, who we would have never seen on a bus tour...we had her all to ourselves because we were walking to the visitor center. 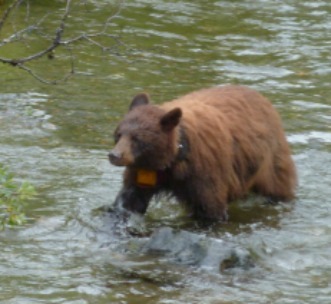 We enjoyed showing our picture to other tourists at the visitor center and to the Rangers... Who identified her as Nikki, an animal that they track year-round as you can see by the collar around her neck. Another advantage of the onboard naturalist, was his finding and describing various types of wildlife that teem in the waters of the inside passage of Alaska. Here is a shot of a humpback whale displaying her tail very close to the ship, in addition to the humpbacks which seem to be everybody's favorite animal, the otters, sea lions, and Orca whales are all spotted by the naturalist who then announces over the PA where they can be viewed. You can see passengers scurrying, cameras in hand, from one side of the boat to the other, when he would spot an animal of interest. 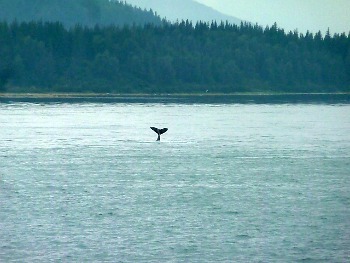 Another plus on having a knowledgeable naturalist aboard, were the lectures offered on glaciers, bears and whales. So when cruise shopping , especially one so rich in wildlife and natural beauty as cruising the inside passage of Alaska... Remember that a competent onboard naturalist can make an already fun experience educational as well. Mark works with our favorite cruise line, Princess Cruise Lines . So cruising is not just nonstop eating and visiting T-shirt shops, you can learn quite a bit from a competent onboard naturalist such as Mark... Thanks Mark for making our cruise more enjoyable. 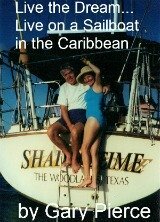 Thanks for reading the onboard naturalist, a great addition to any cruising experience.